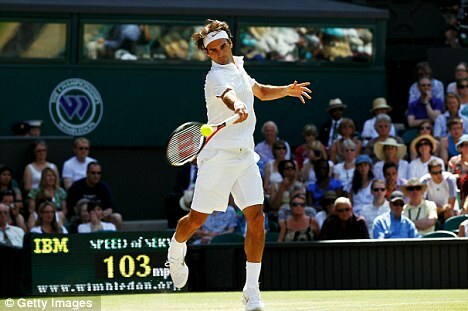 Currently we are in the second week of the sport's showpiece event, Wimbledon. So prestigious that it only requires the location of the competition for people to know what it is all about. You know how the World Cup turns everyone in the country ostensibly into a football expert? Well substituting the World Cup for Wimbledon & football for tennis has the same effect on the UK during June for two weeks. People break out tennis racquets from their closets (for the only time that year) and head down to the park to play on crumbling tennis courts that are growing unsightly weeds and have holes in the net. Even The Queen made a brief appearance at SW19 last Thursday. And this year the tennis has been first rate. In the first week the top 3 players in the men's game have all been pushed to 5 set matches. Roger Federer was almost eliminated on the tournament's opening day in what would have been the biggest shock in the history of the game, while Britain's Andy Murray has looked like regaining the form that has deserted him since losing the final of the Australian Open in January. And now we approach the quarter-final stage, the business end of the competition where matches tend to be tense and thrilling. I hope this rubs off on the women's part of the draw which has been mediocre in comparison to their male counterparts. There were positive signs yesterday after Kim Clijsters beat her fellow Belgian Justine Henin and Serena Williams got the better of Maria Sharapova in a match, which at times had some super tennis. If that quality can be maintained and the men's competition keeps its momentum then we could be in the midst of a classic Wimbledon. This current F1 season was probably the most anticipated in history. And so far, it hasn't disappointed. With four drivers who have held the World Championship on the grid for the first time ever in the sport, as well as a new points system in place, the race to be World Champion has been very open. So far five different drivers have held the top spot. And I'd expect to see more changes before the season reaches its end. With the odd exception, every Grand Prix has been riveting, though not always for the best reasons as Mark Webber was involved in a horrific crash in Valencia on Sunday. But even that demonstrated the sterling work done by the sport's regulators in ensuring that one of the riskiest sports that there are is as safe as humanly possible. If Webber has been involved in a similar incident 10 years ago he would probably be dead. And so far we've seen an absence of conspiratorial team orders or processional races. If you've won a Grand Prix this season, you've damn well earned it. The competitiveness has been at it's fiercest. My only worry is this spilling over into bending and breaking of the sport's rules as the fight to be top dog grows ever more intense. But there's no tangible evidence for such a thing happening, and it would be churlish to complain about a season that has been compelling so far. Long may it continue. Whoever takes the World title this season will be the worthiest of champions for many years. It's almost gone unnoticed but England have become a pretty good cricket team in the past year. And understated success seems to be how this England side like it. After taking advantage of an underperforming Australia to regain the coveted Ashes last summer, their astute coach Andy Flower & captain Andrew Strauss have set about making England a major force in all formats of the game. First, Strauss in what was a wise and selfless move, abdicated from being England's 20/20 captain. Knowing that he lacks the raw power for that slimmed down, fast-paced form of cricket, he handed the reins over to Paul Collingwood. In little over a year, they became the 20/20 World Champions. This is England's first ever global title, and was achieved with something of a flourish, with the mighty Australia taking a pasting in the final. And this summer, England have continued this positive momentum. With Strauss returning to captaincy duties, England have won their last five Test Matches and are currently in the middle of a 5 match One-Day series against Australia again. The rivalry between the two is the most fearsome in cricket, and in recent years has been dominated by the men from Down Under. But it seems that the tables are inexorably turning. After losing The Ashes and the World 20/20 final to England, Australia are now on the wrong end of the current One-Day contest. England have already won the first 3 matches to take the series. What is most heartening for England supporters is the manner of these recent victories. This country has a lazy stereotype of winning in a tense and fraught manner. Even though that's not true, this England side have attained their success in a dominant and ruthless manner. Not only are they making a habit of crushing Australia, but they seem to expect that they will do so. Dare I say, they even quite like it. And at the end of the year, England go to Australia to defend The Ashes in what promises to be a mouth-watering encounter. At the time of writing I view Australia as favourites to win, but it seems that in the past year the England cricketers are doing a good job of changing my mind. Regardless, if you're English, it's nice to have a team that makes a habit of winning right about now.